Today I'm going to actually add another post to the Bombay Street Food Special Series I'd started a while ago. I'll bet you thought I was done with that. But I'm not. I will keep adding to that section, because I love street food. Today's recipe, falls under the chaat category and there is a more fully loaded version with a number of chutneys and stuff that I so want to try making at home, I've just never gotten around to it, but this version is a quick and easy treat that you can munch away on in about 5 minutes. It has lovely fresh flavors and it makes for a quick, healthy snack. It is ideally served with some papdi, which is a small crispy puri. I didn't have any handy and haven't yet tried making them, but soon will. I did the next best thing. I served it with some of my homemade tortilla chips. The street food stalls in Mumbai sell portions of this chaat in paper cones and patrons use the crisp, but sturdy papdi as a spoon. Mix the onion, tomato, chilly, salt, lime and chaat masala lightly, in a bowl. Add the puffed rice, crushed papdi / tortilla chips and sev and toss well. 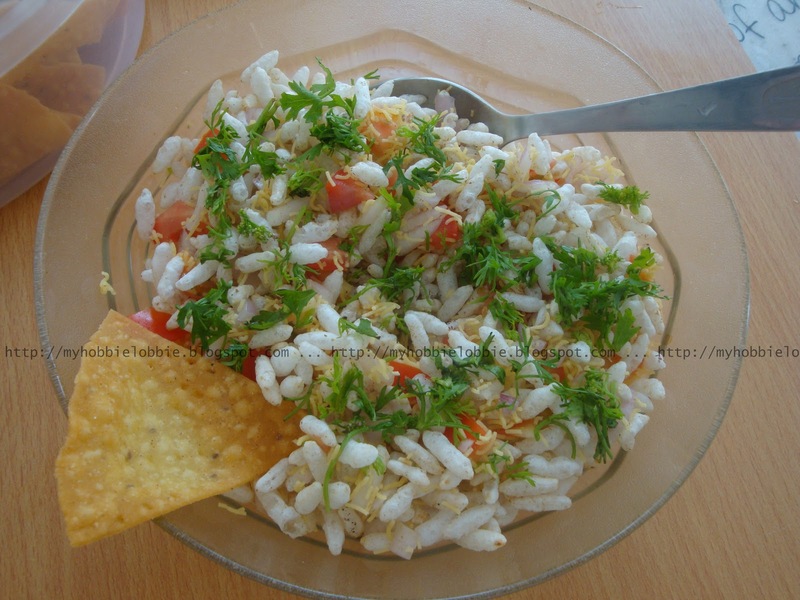 Garnish with the chopped coriander leaves. Serve with a whole papdi / tortilla chip. Love this recipe! I'm not sure I've ever done anything with puffed rice. I will be saving this recipe to try later though. This sounds really good - I love the contrast in textures between the rice and the tortilla chips, and the spices sound fantastic. Thank you for sharing the recipe with the Hearth and Soul Hop. Thanks for stopping Jason, enjoy your puffed rice salad! It is rice dishes, like yours, that make me realize how yummy and versatile rice really is. This recipe is being featured on My Meatless Mondays, tomorrow. Come on by and please do bring more recipes. Thank you Chaya, I'm honored!